What makes you feel calm? At home? Alive? For me, its the beach. It’s the messy hair, salty air, sandy feet feeling. My favorite. I’m from Pensacola Beach and I just love it. I’ve started putting more beach photos in my home. It’s a simple thing that makes me feel happy and at home. With January 1 quickly approaching, a lot of us are thinking about how to make next year happier, easier, smoother, less stressful. And while we’re each probably thinking of lofty (and great) resolutions like losing weight, relaxing more, eating healthier, etc. sometimes it’s the smallest five minute changes we can make that really make an enormous impact on our quality of life. 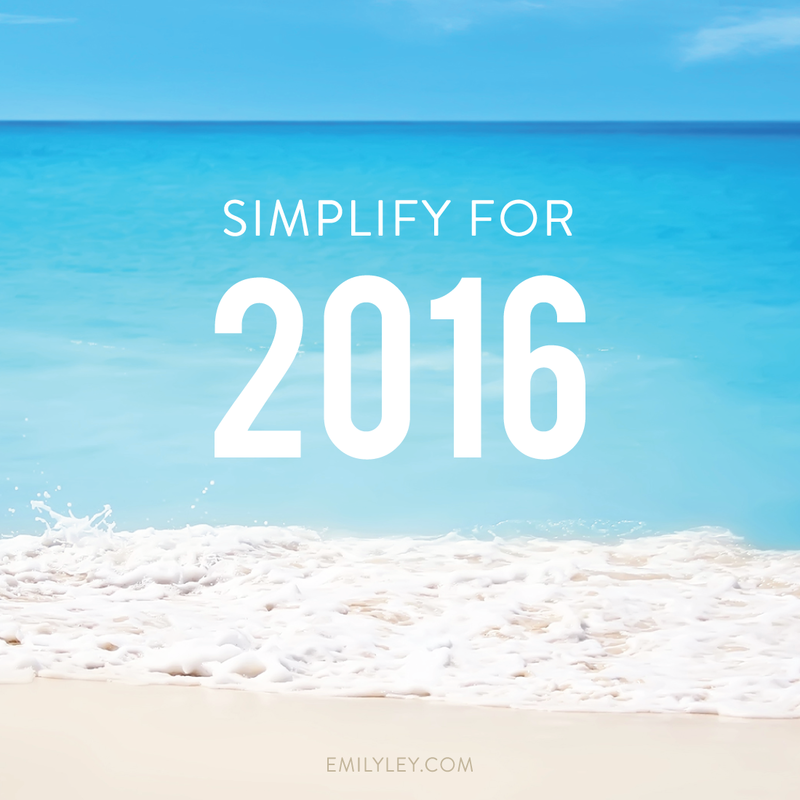 I’ve pulled together a list of quick changes you can make to set yourself up for a more relaxed, less cluttered 2016. I am a big believer that physical clutter = mental clutter, so many of these tasks involve simplifying, eliminating and turning the noise down on the STUFF drawing our attention away from what really matters. Begin by setting aside an evening to go over your year and the upcoming year with your spouse or your family. You can download our Free Family Meeting Printable here. What worked? What didn’t? Write it down and commit to making positive changes for yourself and for them. Delete (don’t just put them in folders) unwanted or unnecessary apps, software, files or photos. Clear the ones you don’t need to keep and get the rest into one great place. I love Chatbooks and Social Print Studio for printing Instagram photos and use these square-photo sleeves along with Project Life for easy scrapbooks for my photos. This photo storage solution is also a great idea for storing photos in a safe digital place. <– holds 32,000 photos! This is a great resource for stopping unwanted or extra mail, phone calls and email. Opt out of prescreened credit and insurance offers for five years by calling 1-888-5-OPT-OUT. Visit the Direct Marketing Association’s website to opt out of junk mail and advertisements here. Visit Unroll.me to view all the emails you are subscribed to. Unsubscribe from them in bulk or add to your daily “roll-up” to see them all in one email. Stop unwanted telemarketer calls by calling 1-888-382-1222 to put your number on the national Do Not Call list. You will get fewer telemarketing calls within 31 days of registering your number. Keep the apps you use every day on your home screen and move the others to the next pages. Change your lock screen to something that makes you happen and your wallpaper to something that makes you feel calm. Here’s the wallpaper I downloaded free! Also, turn off those notifications. I have 0 notifications on my phone except text messages and phone calls. IT’S SO FREEING. On an iPhone: Settings > Notifications > turn them off! Check out services like Shipt (grocery delivery), Amazon Fresh (grocery delivery), Amazon Prime (free two day shipping of just about anything you can think of!) or Drizly for delivery of alcohol or wine (great before a get together!) PS: Have you seen these Amazon Dash buttons? Stick them near the products they’re for and when you’re low, simply hit the button (approve on your iPhone or set up one-click-shipping) and they’re on their way to you. Life changer. Did you know you can schedule a pickup from Salvation Army? I do it all the time with my kiddos clothes, toys, and household items I need to donate. Declutter and fill your home with the things that make you feel joy: yummy smelling candles, photos of loved ones, your favorite books. This doesn’t have to cost any money. Simply rearranging can lift your mood and make a big impact on your life. 8. Simplify what you allow take up valuable brain space. Unfollow anyone or anything that doesn’t bring you joy on Instagram, Facebook, etc. Make your feed a place of inspiration. 8. Set up a system. Whether you choose a magnetic weekly calendar on your fridge, a printed monthly calendar on your bulletin board or a planner (ahem, I know of a few great ones with free US shipping until 1/1. Use code HOORAY2016 here) or PowerSheets (by my friend Lara Casey), commit to it and make it work for you. That means spending some time filling it out and discussing the routine with your family.